looks good mate and I like what you did with the flight stand, it doesn't jump out like it would clear. 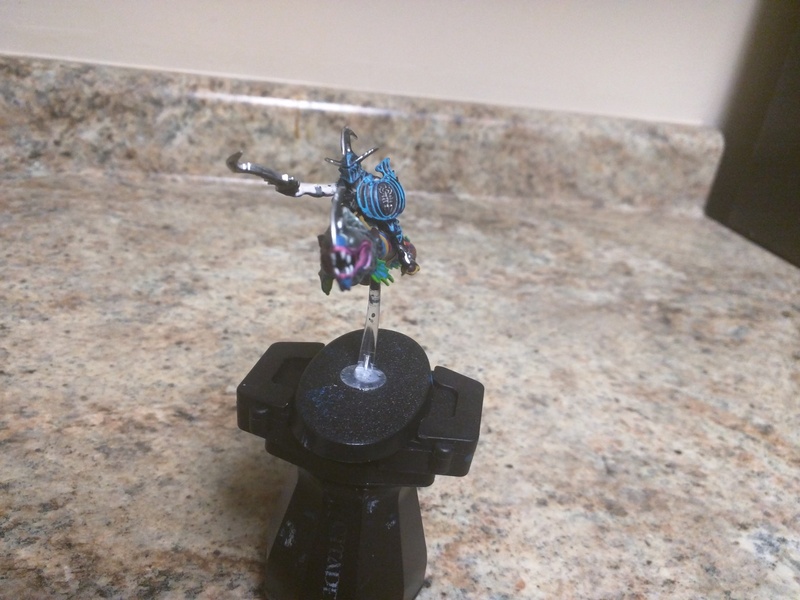 Thanks, Mage, I actually just decided not to cover the flying stand when I primed it, but I think you're right, it does blend in a lot better. 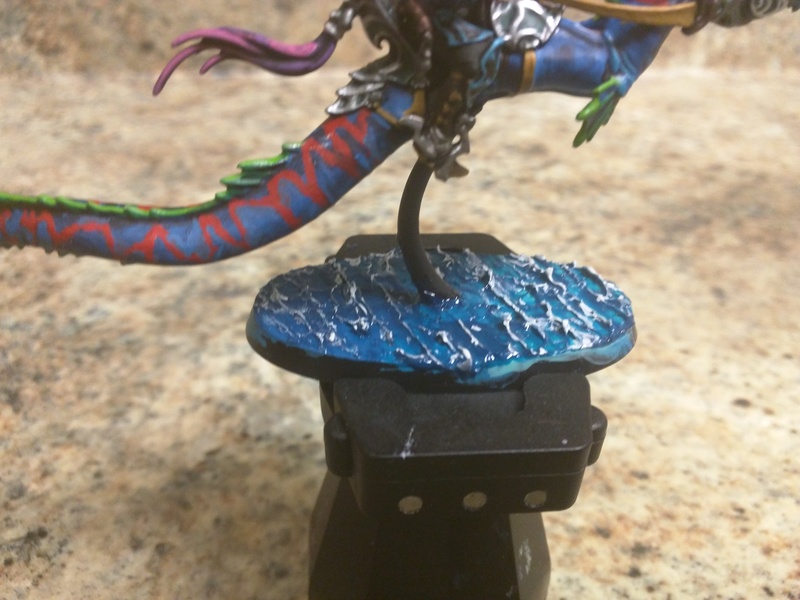 I used your tutorial to improve on my water basing, using Teclis Blue, Temple Guard blue, and the nihilakh oxide. Didn't manage to pull off the larger waves, I think the first layer of gel was spread too thin. But I think it does look a lot more vibrant with the color transition from deep to coastal waters . I think I'm where I want to be with the ocean bases. I guess I need to start formulating how I'll base the stormcast . I love the shark! I think the shark skin came out really, really well. The other things that stands out for me are the bronze coloured elements. They're really well executed. Overall, the Allopex is a terrific addition to the force. Nice job. Thanks for the compliments, Loosh ! Long time, so see by the way, glad to see you around the forums again. Yeah, I'm really stoked about how the shark skin came out, when I was in the first stages I thought it was going to turn into a disaster , but I pressed on with it and after several layers, I think it finally started to evolve and come together. I'm glad you liked the bronze elements. I knew I needed another color on the harpoon launcher harness to break up all of that silver. So I settled on a bronze / copper to add some variety to a miniature with already a lot of silver armor plates on it. Glad someone noticed that! I'll be posting up an image or two of what I've been up to once I get off of work tonight. 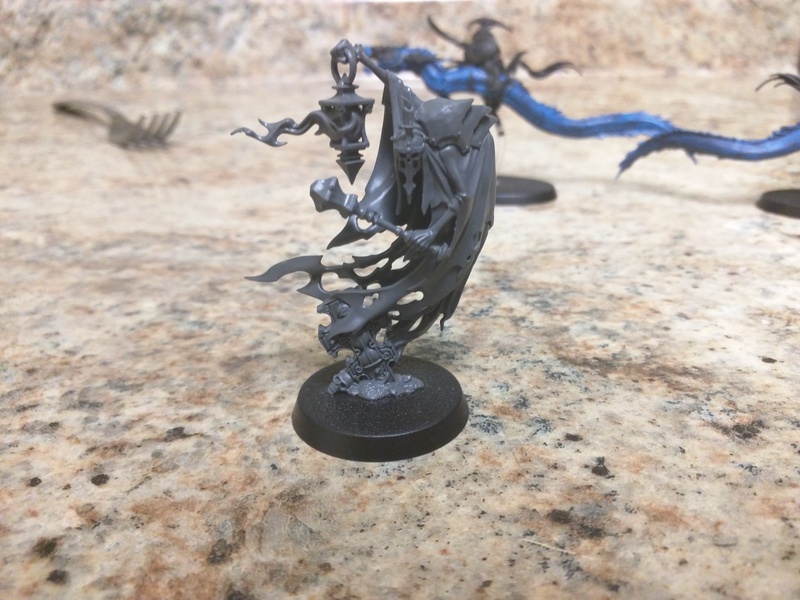 I won't be posting these to show anything off, but I'm more looking for advice because I'm somewhat stumped on how to proceed with some of these models. 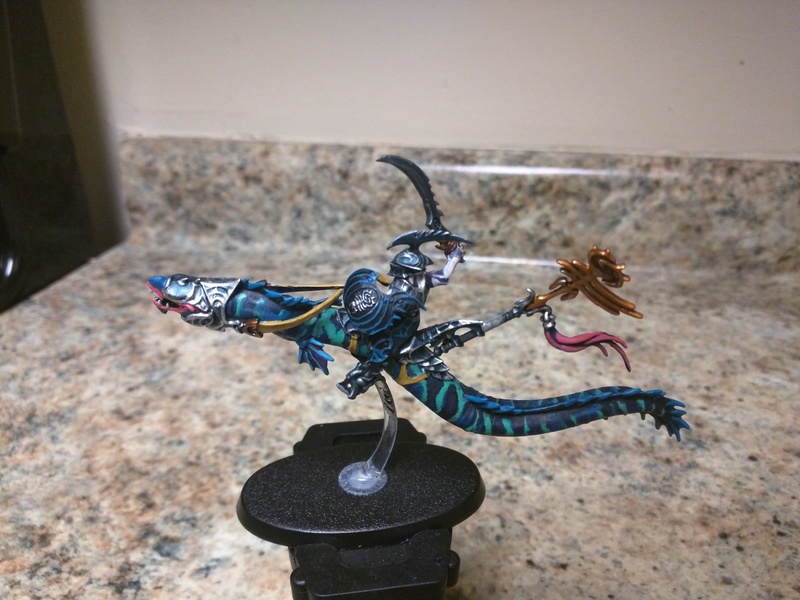 I still have an idea or two on what I want to do with the Akhelian Guard. 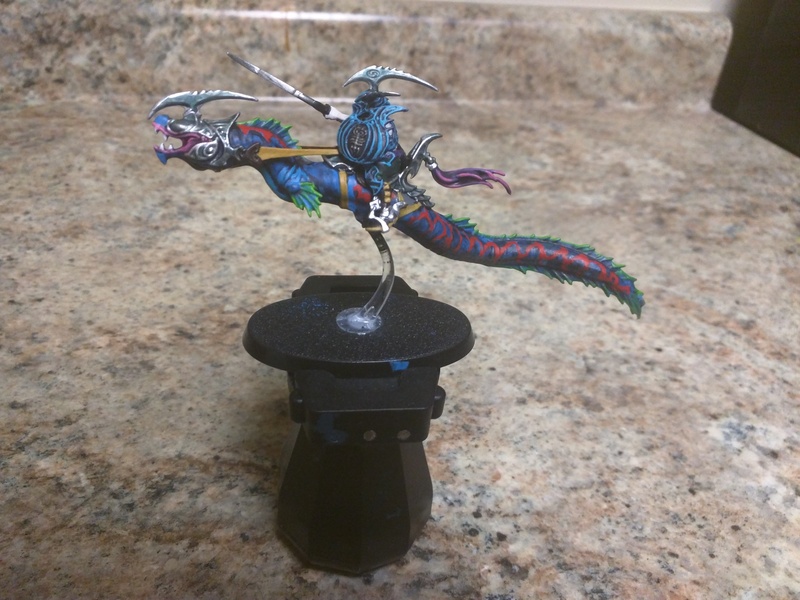 But the colors I'm using for the celestial dracoline don't seem to be jiving together like I thought they would. More on that later though. For these guys, I'm trying to decide what a good layer for the skin would be. 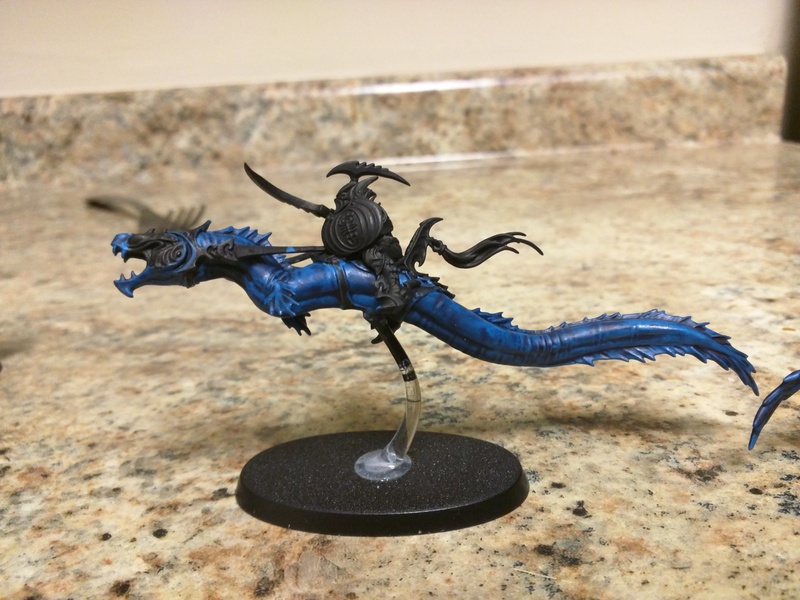 I based them with mechanicus standard grey and then Teclis blue to experiment with the color scheme a little. I washed them with Drakenhof Nightshade. 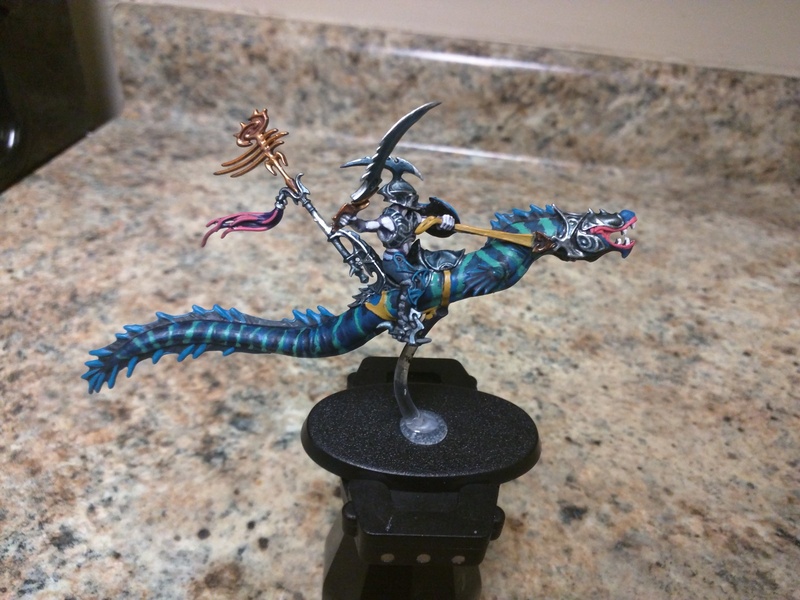 I might just layer up with Teclis blue again and use some brighter green highlights for the pattern on the skin, like sybarite or sotek green. For Astreia Solbright, I've tried highlighting her skin a couple times, until I reached the point that I felt that I had to start over. 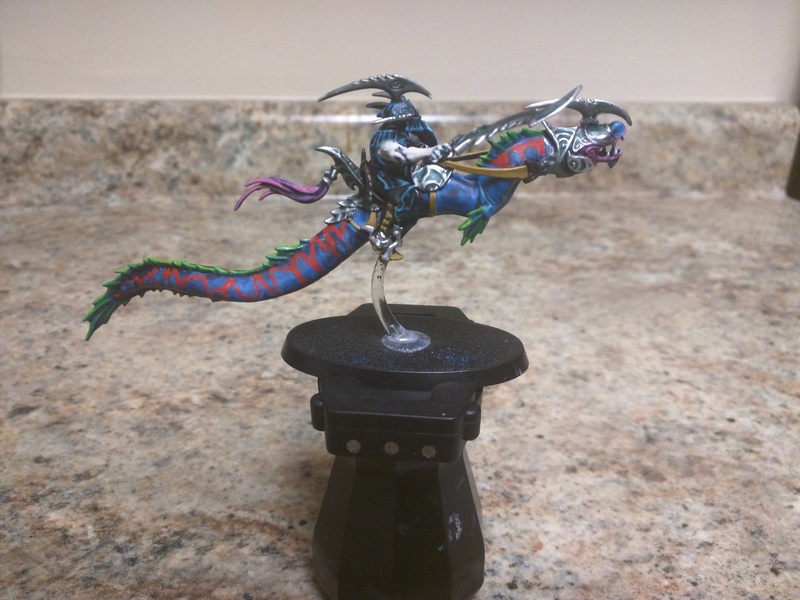 I basecoated with Daemonette Hide, which I felt was still pretty bright for a base paint. I toned down the skin with an overall wash of Druchii Violet, then I tried to layer most of the skin up to Warpfiend grey... 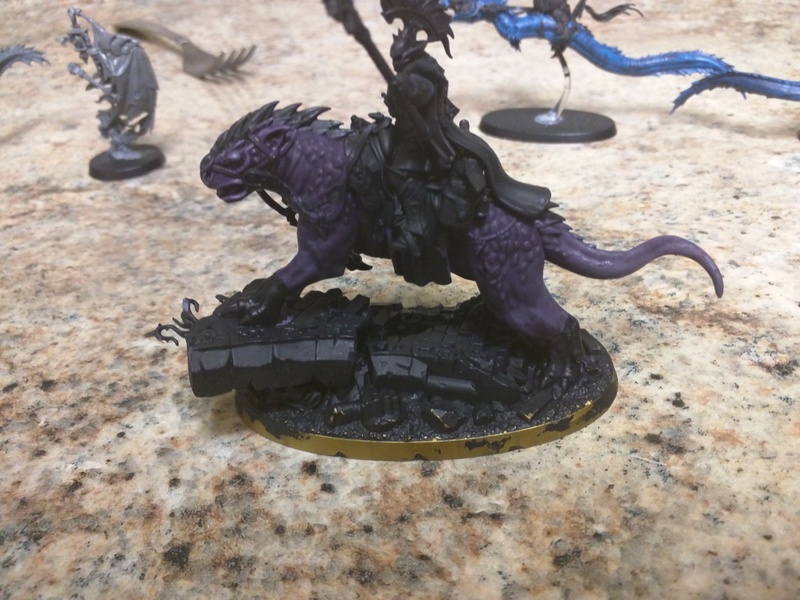 The Warpfiend grey looked so unnaturally bright and weird even though it's supposed to layer over Daemonette Hide. Maybe I'm highlighting it wrong and just need to focus on edge highlighting? 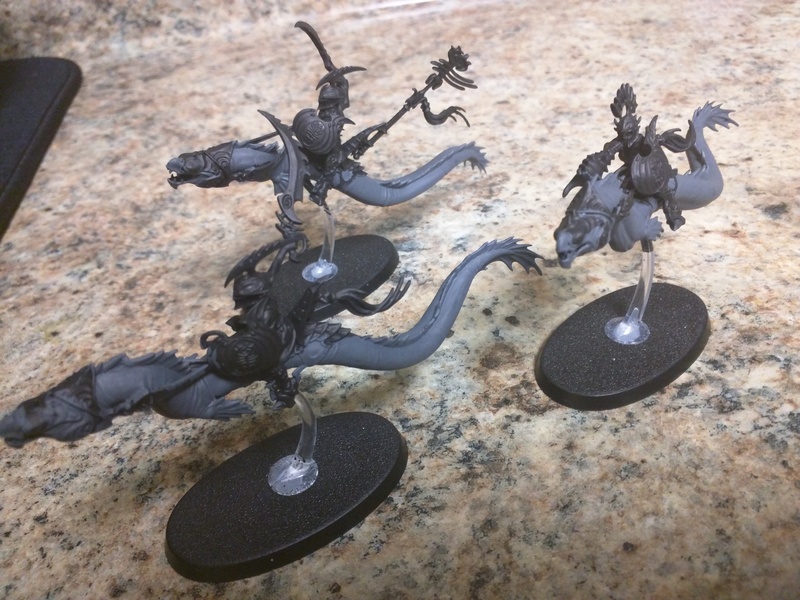 I've kept these guys based in the Mechanicus for now until I figure out how I want to paint this unit. 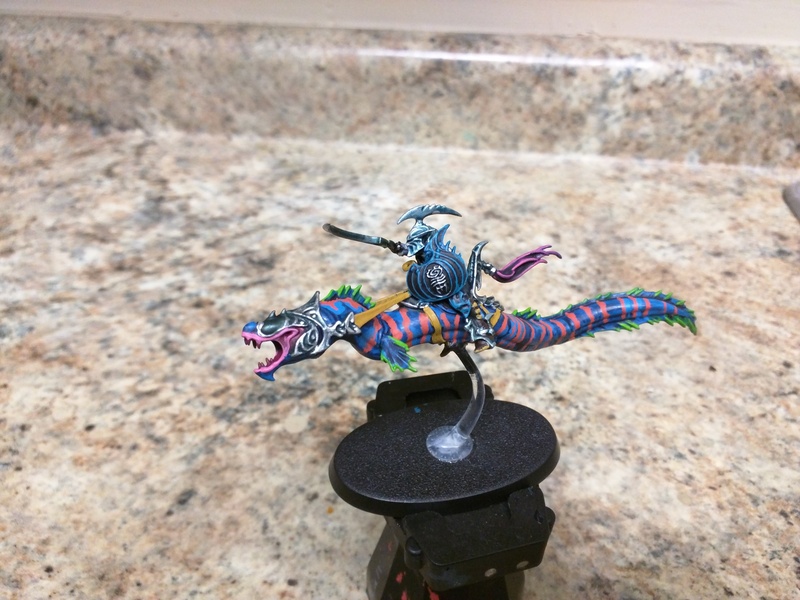 I have a mind to try and mirror the Allopex Shark I painted before. But I want to keep the whole unit consistent I Think. Also, managed to snag this ghostie off of ebay!!! 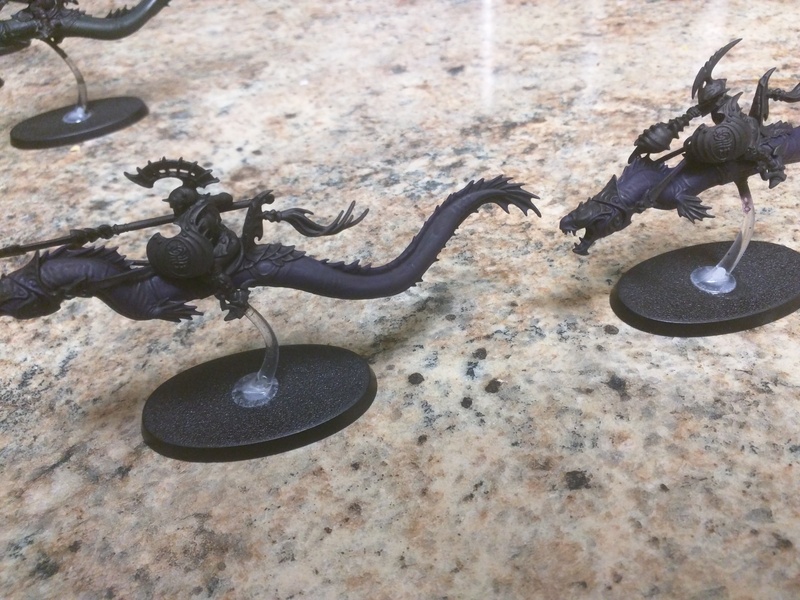 Ooh I like the mottled look you've got on the angry eels clever way of doing it too, varying the basecoat and then washing over. Thanks, Ynnead, though the result wasn't entirely planned for ! I'm going to try to keep the mottled look even after I apply a few more highlights to layer the skin back up. 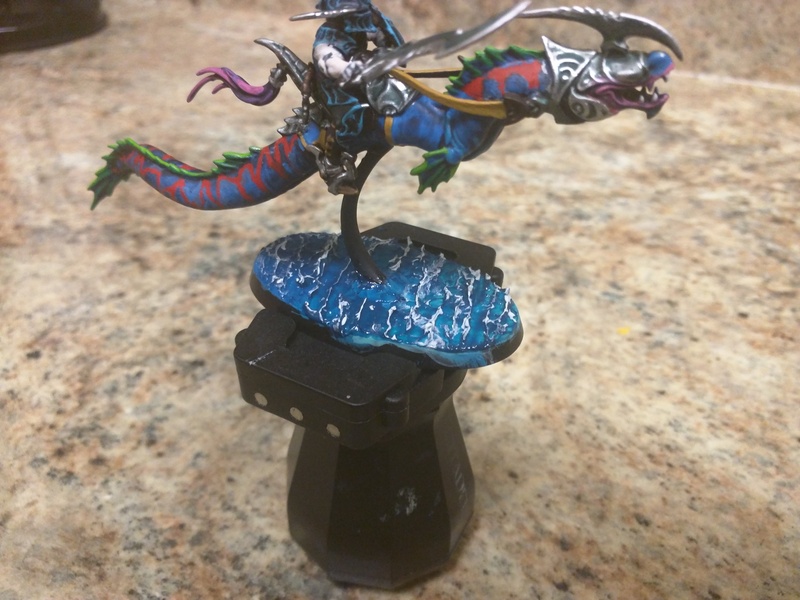 I'm going by my GW tomorrow and will probably pick up some orange, red, and purple paints so I can add some variety to all of the fins . 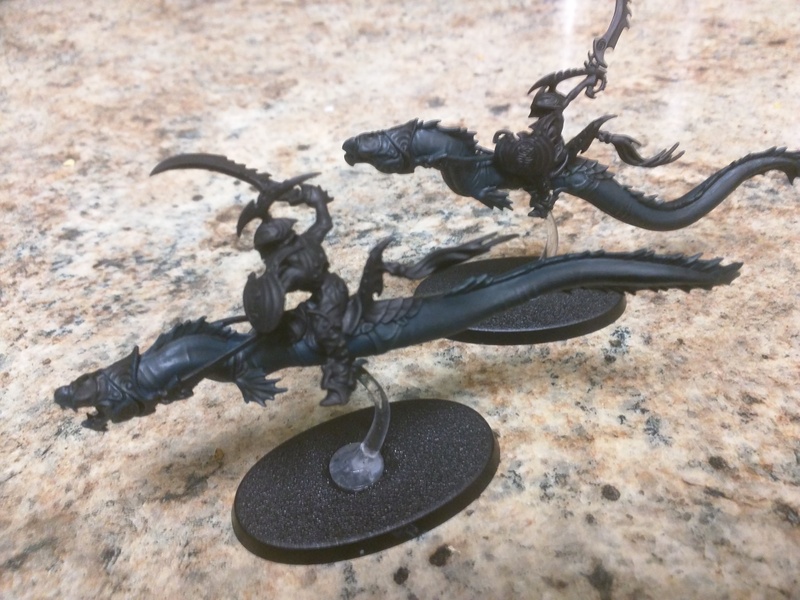 WIP Akhelian Guard: Base Colors for each Akehlian Guard Pair: Naggaroth Night, Caliban Green, Ahriman Blue, Stegadon Scale Green, and Incubi Darkness, perhaps not necessarily in that order. 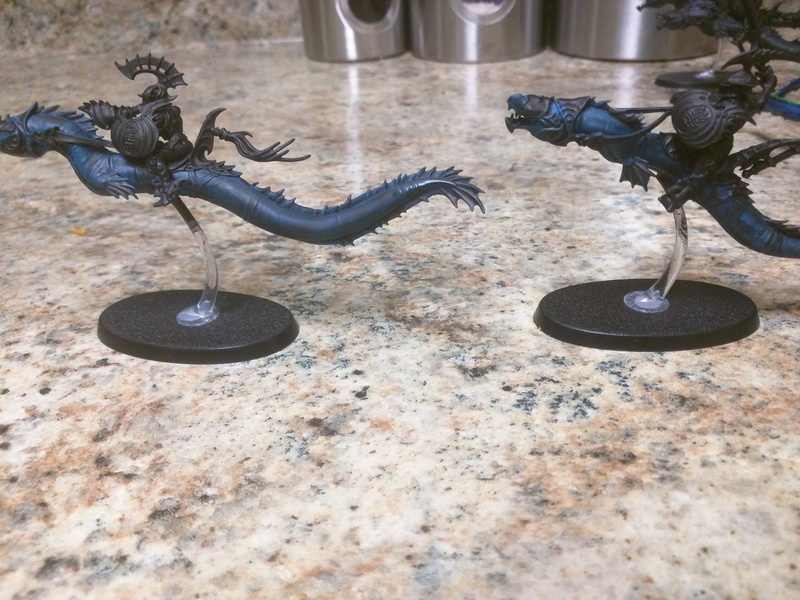 The Incubi and the Stegadon Scale look pretty similar after I gave each model their respective washes. 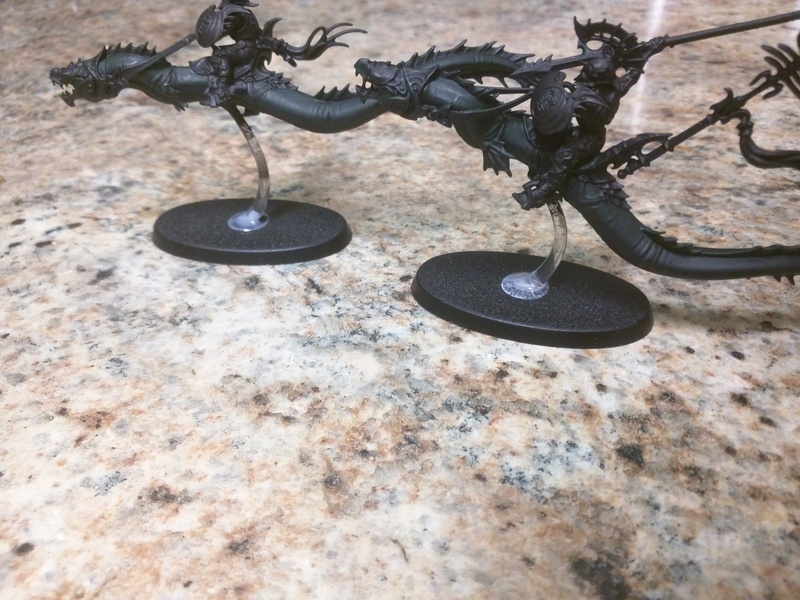 Hopefully I'll be able to brighten them back up and make each of them a bit more unique. interesting colour combo with the green on the fins, its just different enough to notice with out standing out. I like it. Thanks, Mage, still wondering whether I should do a smaller, more extreme highlight of moot green on the fin edges. 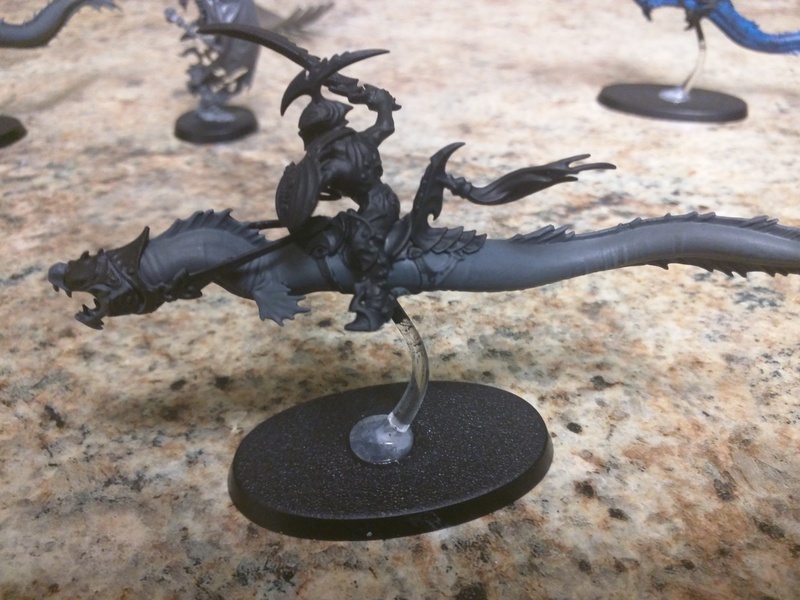 Still wondering how I'm going to build the skin of the Teclis-Eels back up. 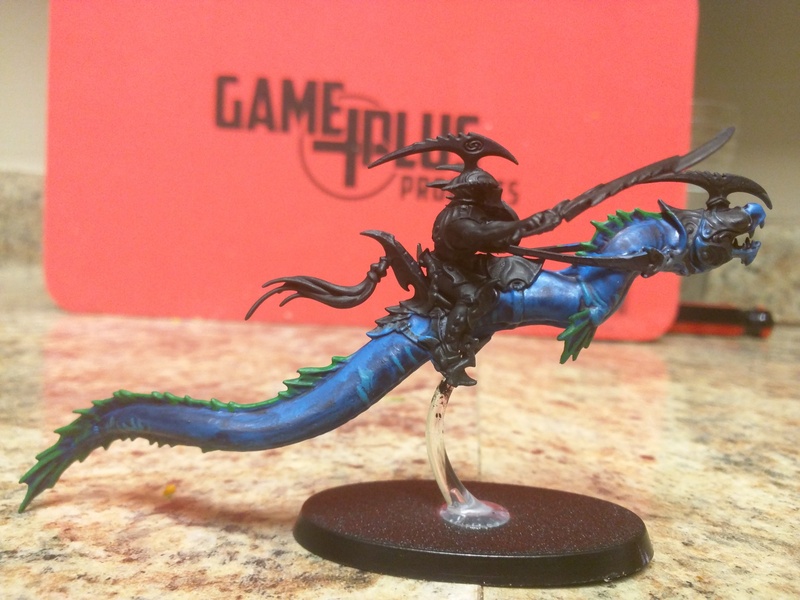 I think I might end up using some Ahriman Blue to do so. Love the colors, almost elecric. If you'd like I think using a bright orange faded down on the red might just add that extra electric look. Other then wow! Thanks, Dread ! I actually had a similar idea to do something like that, except I was going to make the entire pattern orange. But I'm liking your idea, didn't really think about that, so I think I'll try it out this weekend. Do have some orange colors, but I think the ratio of thinner I used to pre-thin them has left them ruined I'm afraid. Might not be worth it to pre-thin those lighter colors, they're already thin enough I think. EDIT: Sorry! Called you DoW by accident Dread. For some reason I keep getting both of your names swapped around in my head . First off, being called DoW is a compliment so your ok. 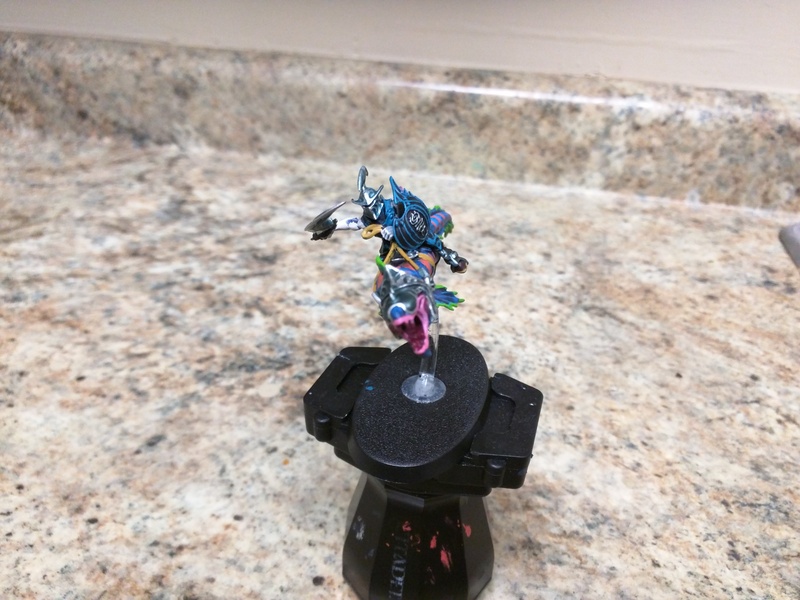 I have to say how well the colors really make these models so cool, electric like i stated. To see them on a table would be a real honor. The blues on the rider and pinks compliment the model so well. Keep it up. I hope to get some pics up soon. 3 weeks of being sick has really sucked. The lighter tone is much more complimentary to the blue and makes the scheme much more natural. It would be neat having slight variations in the strips of colours ranging from purples to reds to oranges on different models in the unit. Just as in nature there are always genetic variety, I think it looks great on the tabletop. Thanks for the compliments and feedback, guys, I'm glad that you like them! I should note that I've changed the original red color on the first eel to orange as well. It would be neat having slight variations in the strips of colours ranging from purples to reds to oranges on different models in the unit. Just as in nature there are always genetic variety, I think it looks great on the tabletop. I've had a similar idea, Dread, but my thought was to do one particular variation in pairs. 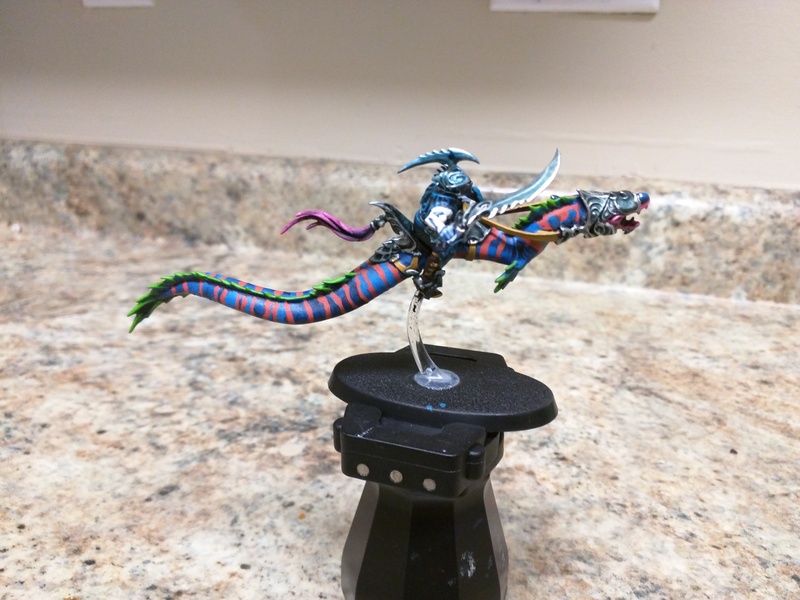 Such as the blue skin, orange pattern, and green fins that I've applied to these first two Akhelian Riders. 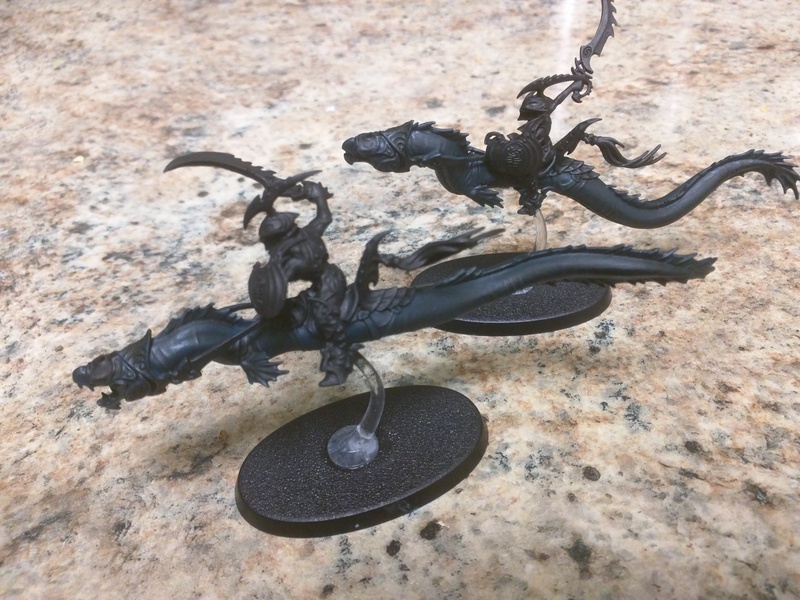 Two might be a strange number, but I don't think I have enough paints to do a truly unique scheme for each Eel . So expect the next pair of riders to change it up a bit! Very vibrant! I also like the bluish tinged steel of the rider. What's the recipe for that? Thanks, Ynnead! Gulliman Blue + Coelia Greenshade + Lahmian Medium, if I recall correctly. You can find the recipe on one of Game Workshops Ionrach Robes turtorial. 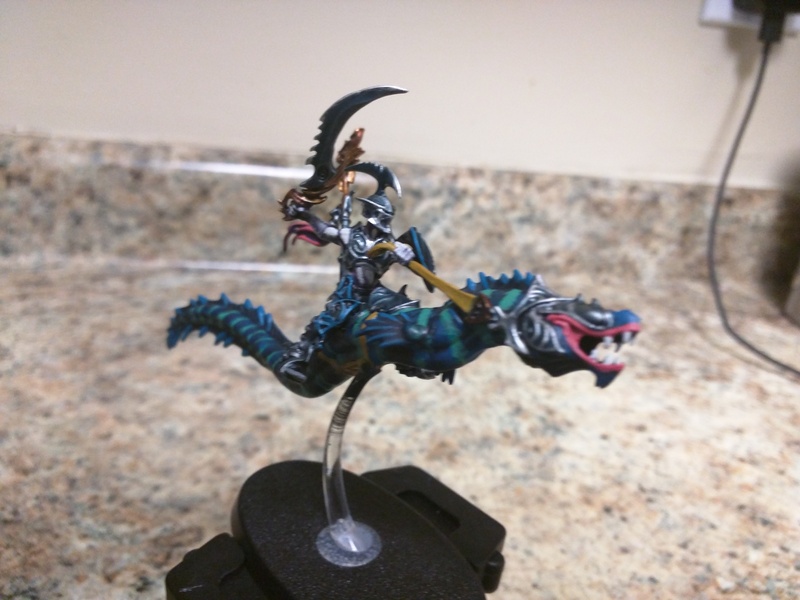 Another Akhelian joins the ranks ! 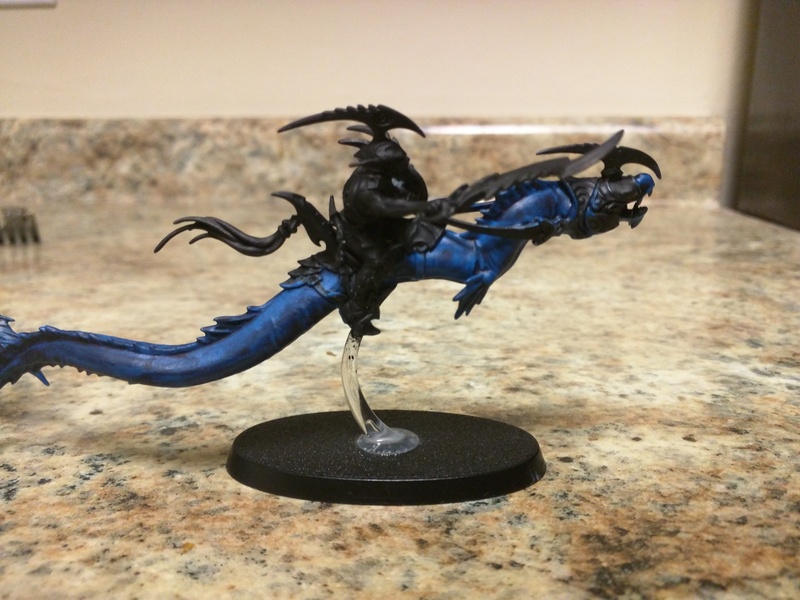 I tried some variations in the Morphann scheme, mainly the armor and a Gulliman Blue + Lahmian Medium + Druchii Violet for the skin. Curios as to what you guys think of it !